Base on our ART supertrend system, Singyes Solar 00750.hk is an awesome uptrending stock, up near 400% since 2012, currently it is trading near the short term support at $13.50, trader do watch out if price fall below $13.00. 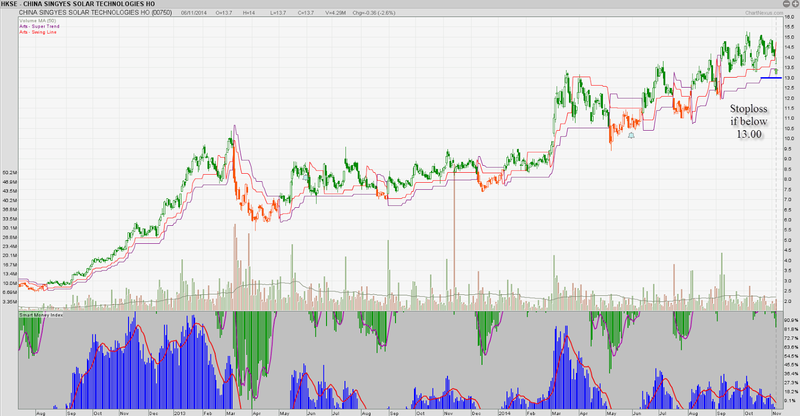 Previously in June, Credits Suisse make a target price at $16.40, seems like this stock is on its way there. According to the latest research report by Credit Suisse, distributed solar markets in coastal regions of China shall provide compelling returns to solar PV enterprises, thanks to ample of factory rooftops, high electricity cost and generous government subsidies. The bank pointed out the latest policy reflected the central government considers the development of distributed power grid as a long term strategy. Credit Suisse believed SINGYES SOLAR (00750.HK) +0.240 (+1.752%) will benefit from the developing distributed solar market, thanks to the diversified business portfolio. Target price was set at $16.4, and rating was initiated at Outperform.